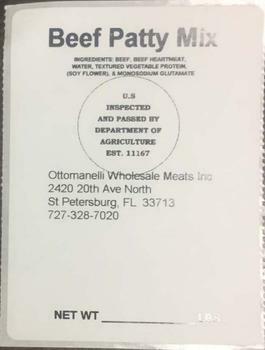 Win Opportunity Knocks, doing business as Ottomanelli Wholesale Meats of St. Petersburg, Fla., is recalling approximately 6,020 pounds of fresh and frozen, raw ground beef. The products may be contaminated with Shiga toxin-producing E. coli (STEC) O45, O103 and O145. The recalled products, bearing establishment number “EST. 11167” inside the USDA mark of inspection, were distributed for institutional use in Florida. Institutions that purchased the recalled products should not serve or sell them, but discard them or return them to the place of purchase. Institutions with questions may contact Tommy Dietch at (727) 328-7020 or by email at Ottomanelliwholesale@gmail.com.